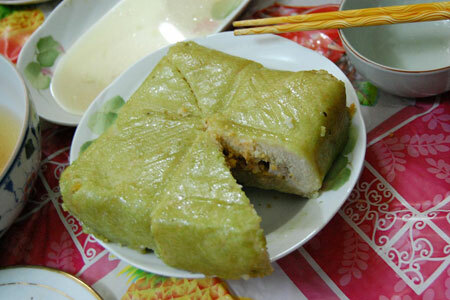 Boiled rice and pork cakes are usually cooked 2-3 days before Tet. Both can be kept for about two weeks in cool temperature. However, after this time they become hard and must be re-boiled. Soak some green beans overnight in water to soften. Drain, rub and clean to remove the skin, and leave to dry. Next, cook the beans in a steamer and grind. Form into balls the size of tennis balls. Soak some glutinous rice overnight. Clean and rinse. Mix with a little salt. Cut fresh pork meat (lean or fat, according to personal taste) into 2cm strips. Mix with salt, fish sauce and pepper, and leave for about one hour. Clean dong leaves (leaves from arrowroot) and place them over each other to form a cross. Place an amount of rice in the centre of the leaves. Shape into a square (the southern version is in a circle). Press a "ball" of green bean on top. Then, add 1-2 pieces of marinated pork, then more green bean, and finally rice. Press firmly into a compact square and wrap the leaves over to cover the cake completely. Tie with bamboo strings. Place in a large pot of boiling water and boil overnight. Squeeze the moisture out by placing it in a colander with a heavy object on top. To serve, untie and open the leaves. Invert on a plate and cut into pieces using the bamboo strings, not a knife. Serve cold. Soak dried bamboo shoots in water for 2-3 days to soften. Boil 2-3 times if necessary. Cut into 5cm strips. Fry with pig trotters and salt. Add water, bring to boil and simmer until meat is tender. Garnish with green onion. Soak dried pig skin (the skin should be yellow, which means it has been pre-treated) in water for one hour. Drain and then add a cup of rice whisky and fresh ginger. Rub onto the skin (this will remove the smell). Cut into diamond-shaped pieces. To make fresh chicken stock, add dried shrimps and dried huong (perfume) mushrooms, which have been pre-soaked in warm water, to 2-3 chicken carcasses. Bring to boil and simmer. Remove the dried mushrooms. Cut carrot and kohlrabi into decorative shapes (flowers, leaves etc). Boil the dried pork skin in the chicken stock for several minutes until tender. Add French/ string beans. To serve, mix all drained ingredients (place vegetables on top) and garnish with coriander. 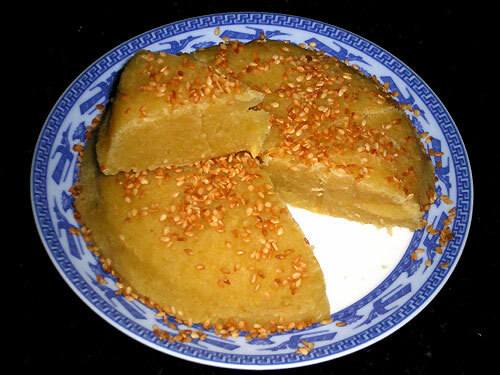 You should make this dish about two weeks before Tet. Clean onions. Dissolve some salt and sugar in warm water. Add onions, cover and keep in a clean, dry place for two weeks. Cut mien into lengths and pre-soak for 10-15 minutes in water. Boil chicken innards (liver, heart, etc), salt and green onions in a fresh chicken stock. Mix with mien and serve. Buy raw minced pork. Add dried mushrooms, which have been soaked to be softened. Mound pork on the mushrooms and boil in chicken stock. Fried version: marinate raw chicken in salt, sugar, garlic, fish sauce and burnt sugar. Fry chicken and marinade in oil. 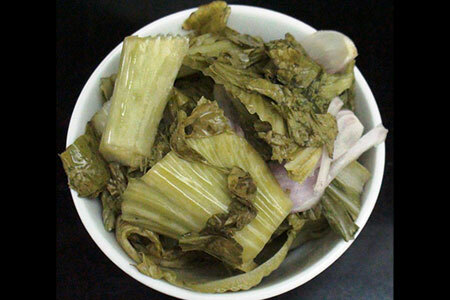 Boiled version: served with julienne lemon grass. Scale carp, cut into steaks and fry. Add finely sliced galangal, fish sauce, salt, burnt sugar and water (this makes the fish turn dark brown). Cook over a low heat until the fish is hard and little liquid remains. Tie up beef muscle firmly with several strips of bamboo. Break cinnamon into small pieces, rub into beef. Sear. Add fish sauce and salt, and cook over a low heat. Only cut beef when about to serve. The meat should be firm but not tough. Soak glutinous rice in water overnight. Drain. Cut open the momordica (qua gac). Remove flesh and large black/red seeds. Mix this with a small cup of rice alcohol. Mix rice with salt and qua gac mixture. Steam in a rice steamer. During steaming, add some chicken fat and stir through. When steamed, add a little sugar and stir through with chopsticks. Mound onto a plate and decorate with the black seeds from the fruit. Soak green beans in water overnight to soften. Rub and remove skin. Drain. Cook in boiling water until soft. Drain and grind into a wet powder. Mix with sugar in a pan over a medium heat. Keep stirring until a little drier and smoother. Place in a mound and invert onto a plate. Sprinkle with sesame seeds. To serve, cut into slices like a cake. Prepare a week before Tet. The most important thing is to maintain the shape of the fruit. Use apple, potato, tomato, plum, ginger, mandarin, or gourd. Apple: Pierce skin lengthwise, but don’t cut too deep. Place in a bowl of cold water and lime. Soak overnight. Wash carefully and dry. Cover in red sugar. Stir very carefully in a dry pan over low heat until sugar melts and solidifies. Take off heat. Press down carefully on top of apple to make into shape evocative of a seashell. If using a kumquat, a traditional Tet fruit, use white sugar to keep the natural orange colour of the fruit. You must also keep the stalk in to keep the shape. You must also carefully press juice out after piercing skin. After indulging in all the above, remember that you cannot throw out any leftovers until the fourth day of Tet. It would also be highly inauspicious to sweep the rubbish from the house as all the good luck you have been working hard at will disappear with it.